UM, 22/6. Tens of participants of Guang Xi Normal University Summer Camp gathered in A1 building hall to join Farewell ceremony held to release them before departing for Tiongkok. 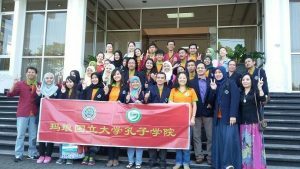 Along with the participants, there were also the Rector of State University of Malang (UM), Rofi’uddin; the Vice Rectors, the Director of UM International Relations Office, Yazid Bashtomi; and the representative of Mandarin Language Center (Confusius Institute), Qin Xiaohe (Vicky). The event was opened with a welcome speech delivered by the rector, in his welcome speech, the rector expected that this Summer Camp can be another way to expand participants’ insight especially in culture by sharing and promoting ideas “This a chance for you to promote and share ideas with other participants about culture in Tiongkok,” said Rofi’udin. In the similar occasion, the guide from UM, Duddy Syafrudin emphasized that this program enables all the participants to enlarge their horizon about cross cultural understanding. The total of participants are 31, 21 students are from UM, 9 students are from UMM (Muhammadiyah University of Malang), plus one guide from UM. They were scheduled to leave Indonesia on Wednesday, midnight from Al-Azhar University, Jakarta along with the other 180 participants coming from the other regions in Indonesia. This program was held to celebrate 65th aniniversary of diplomatic relationship between Indonesia and Tiongkok and 5th anniversary of Mandarin Language Center of UM. A cheer goodbye: All participants and people involved in Summer Camp 2015 took a photo together before leaving UM.